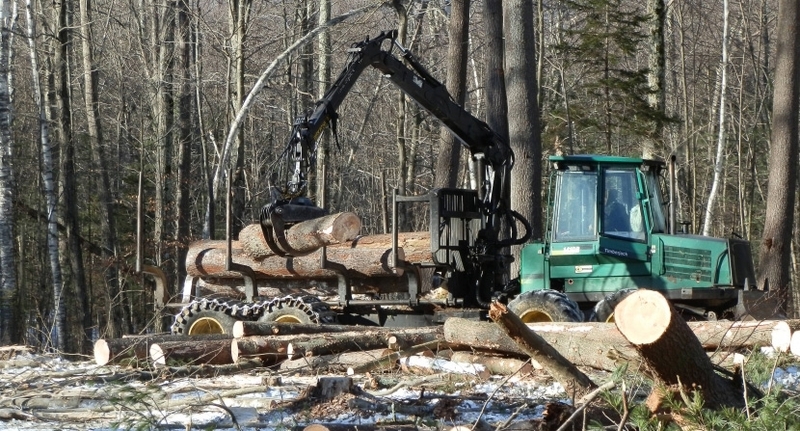 A machine called a "forwarder" in action on Blaine Forest in Jaffrey, NH. Harvesting wood products is a significant part of the Forest Society’s multi-use approach to being responsible land managers. The timber on Forest Society lands is growing in age, in volume and in value every year. Careful timber harvesting can result in the creation of younger forests, thereby increasing the age and size class diversity of our landscape. It also generates income that is used to further support the Forest Society’s mission. Using a comprehensive natural resource inventory, our foresters collect relevant data and use the best available silvicultural science to develop a management plan for each property. These documents guide the timber harvests that will be carried out; each has the goal of thoughtfully and sustainably managing the land it covers. Timber harvesting is often used as a method of meeting other goals for management including the creation of wildlife habitats, maintenance of plant biodiversity, and promotion of recreational opportunities. Our foresters regularly consult with a wide range of other natural resource professionals to ensure we are caring for all the natural resources present. Currently, the Forest Society hosts an average of 5 to 9 timber harvesting operations per year, covering about 650 acres. The cutting on about 200 of these acres is aimed at establishing a new group of young trees. The remaining acres are typically intermediate harvesting operations aimed at removing trees that are mature or of poor quality, while leaving a majority of the existing trees. The type and extent of cutting is determined by the natural resource inventory and the property’s management plan and silvicultural goals. An example of an intermediate harvest would be an improvement thinning where small groups of trees are removed throughout an area to benefit the remaining uncut trees. An example of a regeneration harvest would be a 10-acre silvicultural clear-cut which removes all living trees in an attempt to establish new regeneration and a young forest. As trees grow each year, they increase in height, diameter and volume. Through generally accepted estimates of tree growth, we can estimate the volume of wood that is being accumulated in our forest reservations and compare that with the amount of volume that we remove through timber harvesting. Currently, the Forest Society harvests about 50% of the volume of wood that is added each year. This provides an important indication that our level of harvesting is sustainable. Since our forest reservations are located across the entire state, the Forest Society works with local licensed consulting foresters to manage our active timber sales. These knowledgeable men and women have relationships with the local wood markets and logging operators, and in many cases managed the land before it passed to the Forest Society. The Forest Society is a proud co-sponsor of the Tree Farm (R) Program, and each of our reservations is enrolled in the program as soon as it has a forest management plan. We also pay current use property taxes on our reservations to the over 100 New Hampshire towns in which they are located. A timber harvest often creates a quick, drastic change to the landscape that can seem arbitrary or thoughtless to some. However, a great deal of planning and care has been put into each operation. We offer several public timber harvest tours every year in an effort to provide meaningful outreach and education to anyone interested. These tours provide an opportunity to talk with, and ask questions of, our foresters and loggers. The discussion at these tours centers in more detail on the equipment used to harvest timber, the goals and objectives of the harvest and the value and markets for wood products. This report is one of several produced by the U.S. Department of Agriculture, Forest Service as part of the Forests on the Edge project. It displays and describes information at a national level that can improve understanding of forest land development issues. Published by the Natural Resource, Agriculture, and Engineering Service, 1993.